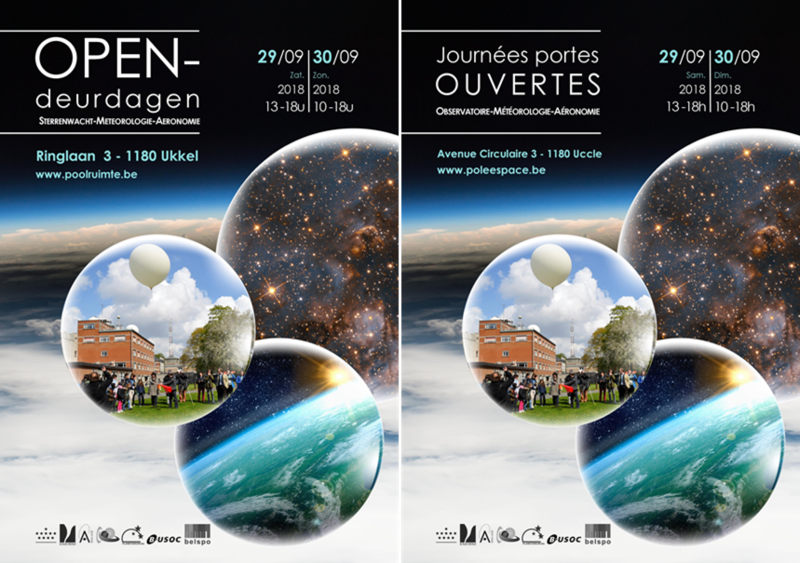 On Saturday 29 and Sunday 30 September 2018, the Space Pole (the Royal Observatory of Belgium, the Royal Meteorological Institute and the Royal Belgian Institute for Space Aeronomy) will open its doors to the public. The program includes activities for young and old. You can visit the telescopes, the climate center or the virtual weather office. Or you can follow one of the many thematic lectures. The creation of aurora in a dark room will surely amaze you, and you can learn everything you ever wanted to know on the study of the Earth, planets, moons and comets from our own solar system to far beyond in the universe. Our scientists will be happy to discuss with you at the various information stands and will also animate workshops and live scientific experiments. There are also plenty of activities for children. A picnic area and foodtrucks will be available on site. The STCE will organize and participate in numerous activities. The solar dome and the solar telescopes will be accessible which allows -weather permitting- to observe the Sun. Space weather forecasters will explain how they (try to) predict the conditions on the Sun and in space, and the PROBA2 Science Centre will have a full-scale model of the PROBA2 solar satellite. A visit of the SSCC, the first European Space Weather Helpdesk, as well as of the Planeterrella, an impressive auroral simulator, is highly recommended. In the experiments tent, scientists will reveal the mysteries behind spectroscopy and how they use this tool in their research. You can also get acquainted with how to draw and classify sunspots. At most of the stands, explanations can also be given in English.